Spring precipitation is the predominant factor that controls meteorological drought in Inner Mongolia (IM), China. This study used the anomaly percentage of spring precipitation (PAP) as a drought index to measure spring drought. 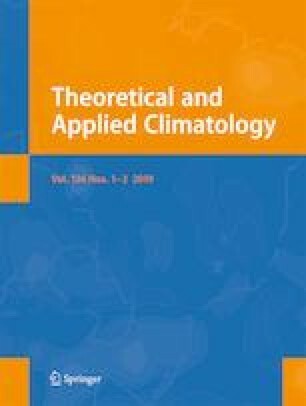 A scheme for forecasting seasonal drought was designed based on evidence of spring drought occurrence and speculative reasoning methods introduced in computer artificial intelligence theory. Forecast signals with sufficient lead-time for predictions of spring drought were extracted from eight crucial areas of oceans and 500-hPa geopotential height. Using standardized values, these signals were synthesized into three examples of spring drought evidence (SDE) depending on their primary effects on three major atmospheric circulation components of spring precipitation in IM: the western Pacific subtropical high, North Polar vortex, and East Asian trough. Thresholds for the SDE were determined following numerical analyses of the influential factors. Furthermore, five logical reasoning rules for distinguishing the occurrence of SDE were designed after examining all possible combined cases. The degree of confidence in the rules was determined based on estimations of their prior probabilities. Then, an optimized logical reasoning scheme was identified for judging the possibility of spring drought. The scheme was successful in hindcast predictions of 11 of the 16 (accuracy: 68.8%) spring droughts that have occurred during 1960–2009. Moreover, the accuracy ratio for the same period was 82.0% for drought (PAP ≤ −20%) or not (PAP > −20%). Predictions for the recent 6-year period (2010–2015) demonstrated successful outcomes. The first author cordially thanks the anonymous reviewers and editors for their constructive comments and suggestions for the improvement of this paper. Many thanks are offer to the NCEP/NCAR of NOAA and the National Climate Center of the China Meteorological Administration for providing datasets. This study was supported by the National Natural Science Foundation of China (No. 40965007 and No. 41665003) and Financial Support for Scientific Research of Inner Mongolia Meteorological Bureau, China Meteorological Administration (No. nmqxkjcx201607).